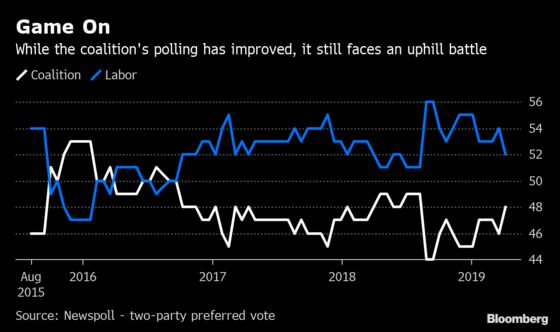 (Bloomberg) -- Prime Minister Scott Morrison called Australia’s election for May 18, with polls showing he’s facing an uphill battle to prevent a shift in power to the left-leaning opposition Labor party. The five-week campaign will be dominated by the stark policy differences between Labor and his Liberal-National coalition, which is vying for a third straight term. They include everything from cutting taxes to boosting wages to reducing emissions in one of the world’s worst per-capita polluters. The coalition government goes into the contest as the underdog, with its six years in power tainted by policy stagnation and infighting that’s seen it twice switch leaders. While the center-right coalition has presided over an unprecedented hiring boom and is forecasting the nation’s first budget surplus in more than a decade, stagnant wages and spiraling power bills have eroded living standards for many voters. 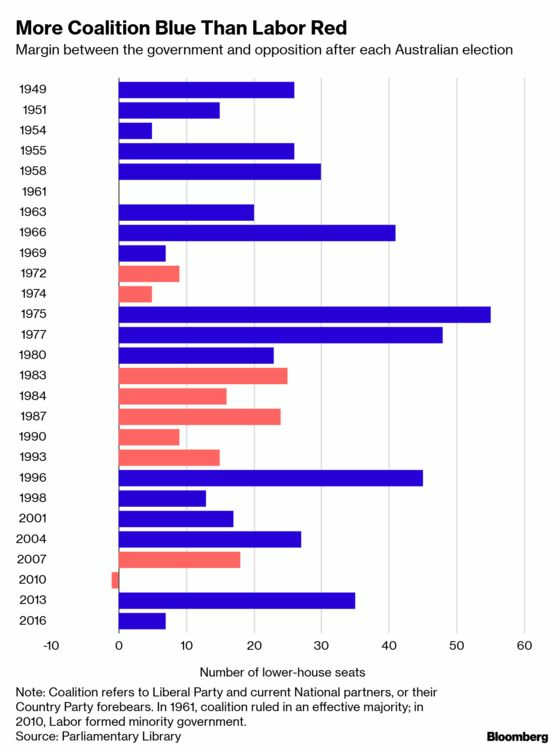 Since the 2016 federal election, the government has lost its majority in the lower house after a defeat in a special ballot, compounding its challenge to win another term. Since replacing Malcolm Turnbull as prime minister in August, Morrison has struggled to close Labor’s lead in the polls. The party led by former union leader Bill Shorten, 51, was ahead by four points in the latest Newspoll. Morrison is trumpeting proposals to flatten tax brackets so more than 90 percent of Australians pay 30 percent or less income tax. He’s also fast-tracking cuts for small and medium-sized companies. The government also plans to continue safeguarding Australia’s borders after halting the tide of asylum seekers smuggled to the nation by boat since the coalition won office in 2013. Labor is targeting its income tax cuts at the lowest paid, earning less than A$48,000 a year. It’s also proposing a “living wage” to replace the national minimum wage, and is pledging to scale back tax perks for property investors after a five-year housing boom priced many young Australians out of the market. Labor’s policies on wages and housing have prompted concern in business circles and handed the government ammunition. She highlighted concerns that wage growth isn’t being linked to productivity gains, and the potential for the housing market slump to deepen further. The biggest divide is around energy and climate change. Partisan politics and policy missteps over the past decade have left consumers and manufacturers facing escalating electricity bills amid a bungled transition from fossil fuel to wind and solar power. The ruling coalition has been torn on the issue for years, with a right-wing faction demanding subsidies for new coal-fired power plants and hindering greater support for renewables. 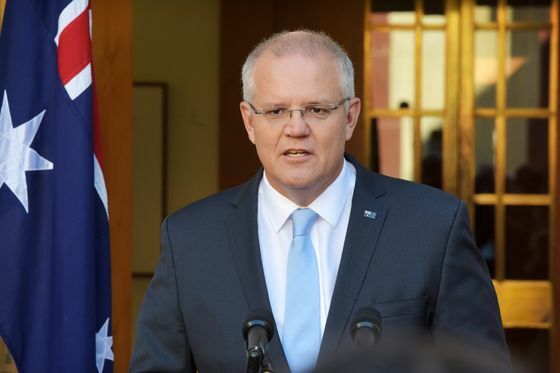 Morrison has championed coal, rejected legislating emissions cuts and said the sole focus of energy policy is to lower voters’ electricity bills through strengthening the power grid. In contrast, Labor is pledging to reduce the nation’s greenhouse gases by 45 percent from 2005 levels by 2030. It also wants to toughen emissions caps and has promised a A$10 billion funding boost for renewable energy projects. A Lowy Institute poll released in July showed 59 percent of Australians believe global warming is a serious problem that needs to be combated even if it involves significant costs -- up from 36 percent in 2012. The survey also found 84 percent of respondents want the government to focus on developing more renewable energy sources. Despite their policy differences, both Morrison and Shorten face a similar threat -- the growing influence of populist, single-issue parties. About a quarter of voters shunned both Labor and the coalition in the last election, reflecting disaffection with mainstream politics amid infighting that’s seen no prime minister serve a full term since 2007. That’s more than double the support minor parties received in the early 1990s. Neither Labor nor the coalition will likely gain control of both houses of parliament, meaning they will have to negotiate with smaller parties to pass legislation and emerge from the current policy inertia. Polls also show that Shorten is personally unpopular, one of the few negatives for Labor heading into the election. Still, he’s presented a unified front since becoming party leader in 2013 and developed a coherent policy platform.